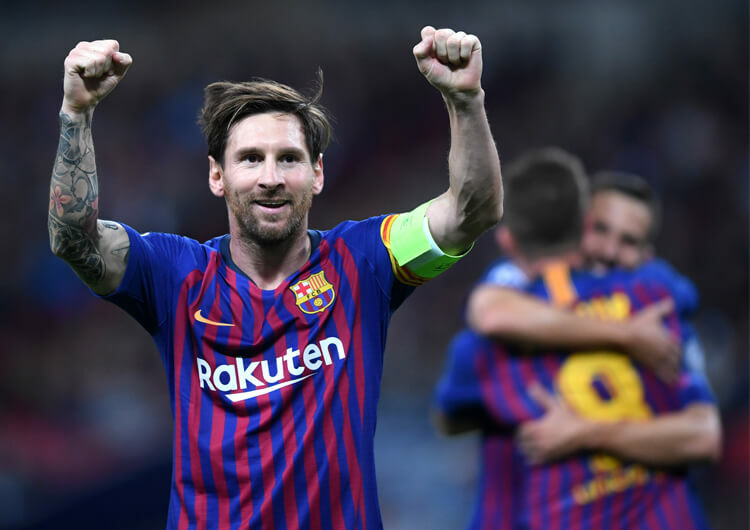 Barcelona lost top spot in La Liga to Sevilla as they were held to a 1-1 draw by Atletico Madrid in a typically tight encounter at the Wanda Metropolitano. It could have been worse for Ernesto Valverde and his team, who fell behind to the game’s very first attempt on target in the 77th minute, when Diego Costa rose at the far post to head home Antoine Griezmann’s corner and register his first career goal against the champions. Barca dominated possession, as usual, and with time running out they managed to pull themselves level – Lionel Messi was inevitably involved, sliding in substitute Ousmane Dembele to place past Jan Oblak and salvage a point, much to the frustration of Atletico head coach Diego Simeone. 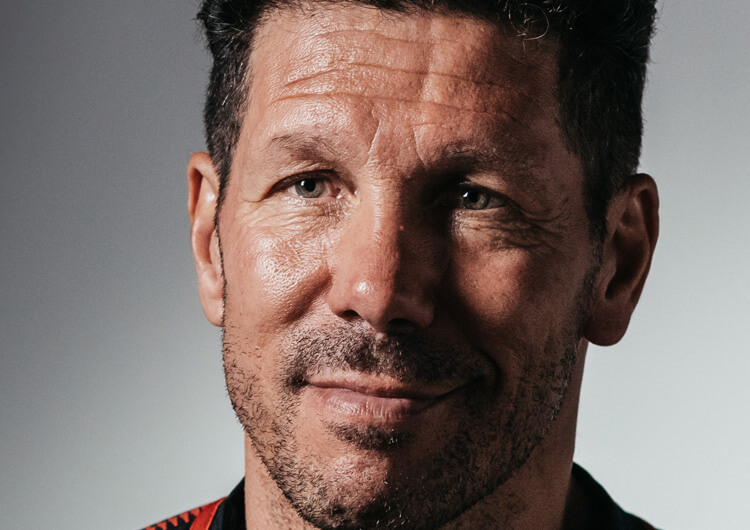 Diego Simeone set Atletico Madrid up in their customary 4-4-2 formation in possession, with Koke, Rodri, Saul and Thomas Lemar across midfield and Diego Costa and Antoine Griezmann up front. Their time in possession was limited (only 33 per cent), and they managed just three shots – with only one on target – over the 90 minutes. 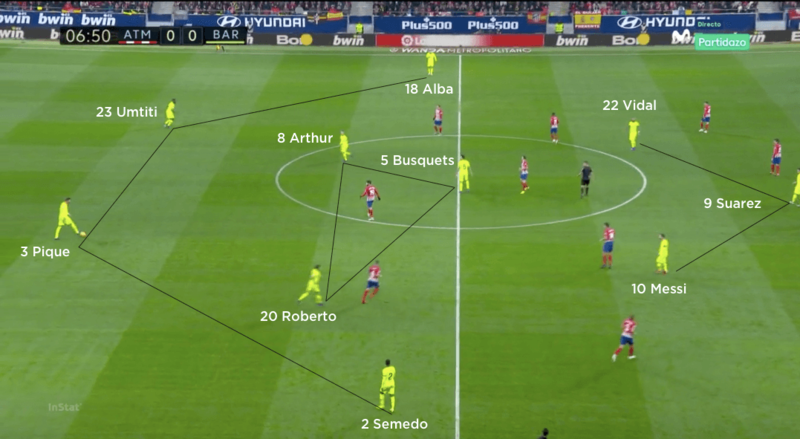 This goes some way to explaining the Atleti gameplan – they were looking to soak up pressure and hit Barcelona on the counter-attack. 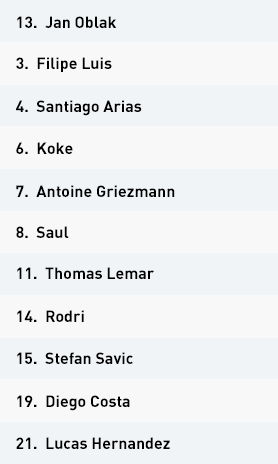 In the rare phases when Atleti did have good possession, they would use Koke and Rodrigo in deep central positions and push Saul and Lemar up high to create a 4-2-4. 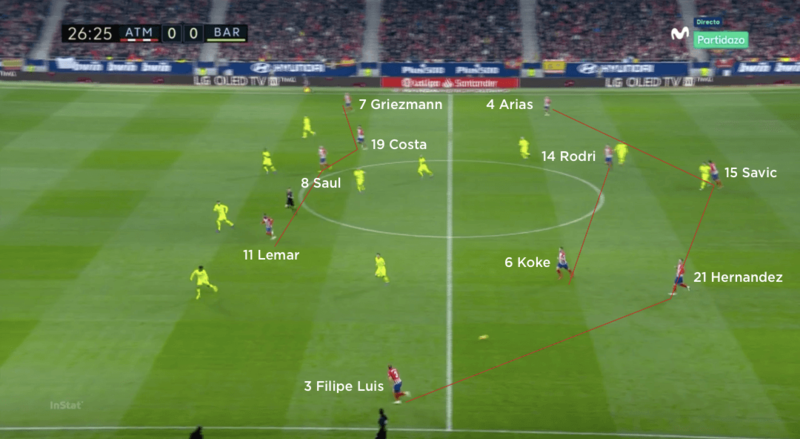 Saul and Griezmann were relatively fluid, in that Griezmann would occasionally drift wide on the right and allow Saul to attack inside, with Costa and Lemar employing similar tactics on the left. 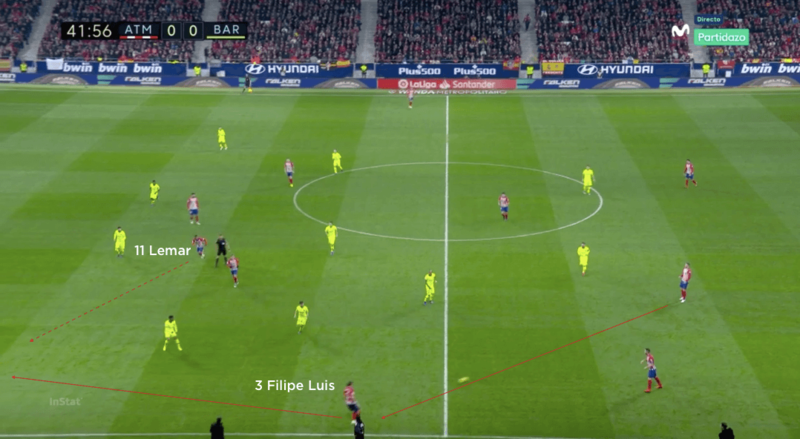 Atleti looked to exploit wide areas and would use the ball out to the full-backs, particularly Filipe Luis on the left, as the trigger for diagonal runs into the space behind the opposition full-back. They would often leave Costa up when out of possession, so that upon regain they could clear the ball from their own area for him to hold up while they transitioned from defence to attack. Out of possession, Atleti used a typically well-organised 4-4-2 mid-block. 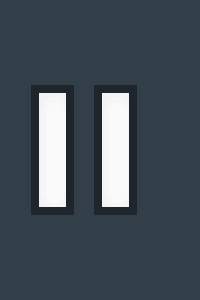 The primary strategy was to deny Barcelona space in central areas, and they achieved this by creating compact units both horizontally and vertically, limiting the space between the lines. The hosts were happy for Gerard Pique and Samuel Umtiti to have the ball; Griezmann and Costa were more concerned with discouraging passes into Busquets in order to stifle Barca’s most creative source from deeper positions. If the ball was played into Arthur or Sergi Roberto, then the nearest Atleti midfielder would close them down and try to force play backwards. The key here was the cover provided by the remaining players within that unit, who would tuck in so that the ball could not be set back and played through. 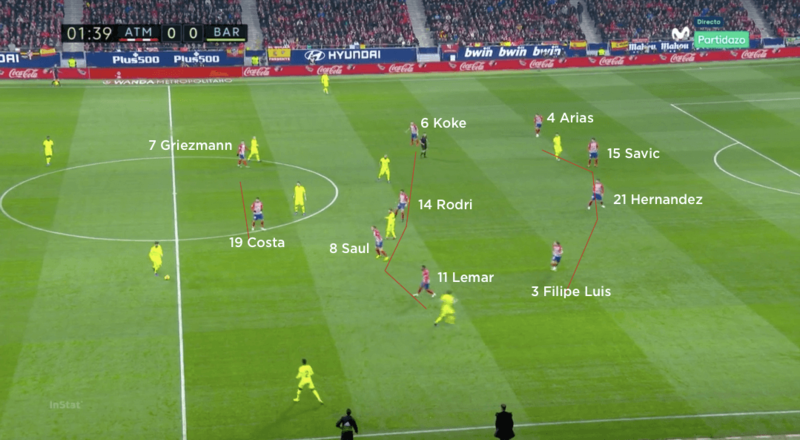 The Atleti defenders were happy to track higher attacking players who dropped deeper, as there was limited danger in the form of runs in behind from Barca. The hosts had a strategy for when the ball was played wide as well. They would defend with three players: the full-back, wide midfielder and nearside central midfielder effectively trying to trap the opponent by the touchline and prevent play down the line, inside or backwards. 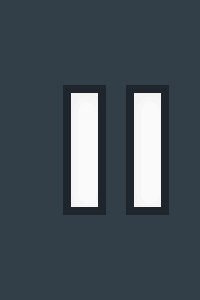 If the ball was in a position where Barca could cross, the back four would remain compact and in position to defend the cross high or in behind the defence. 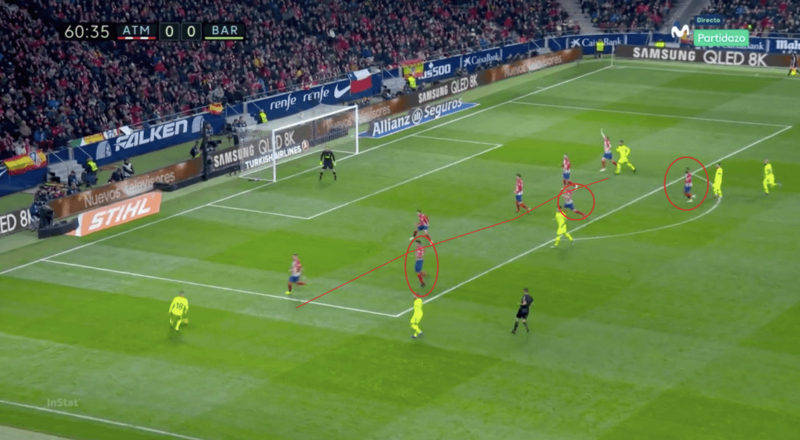 The crucial detail was the role of the midfielders screening and backtracking to prevent the cutback to the edge of the box – an attacking tactic commonly used by Barcelona. Atletico Madrid used a form of 4-2-4 in possession, with Saul, Thomas Lemar, Antoine Griezmann and Diego Costa forming the attacking quartet. Out of possession, Atleti used a 4-4-2 mid-block and would try to protect central areas. 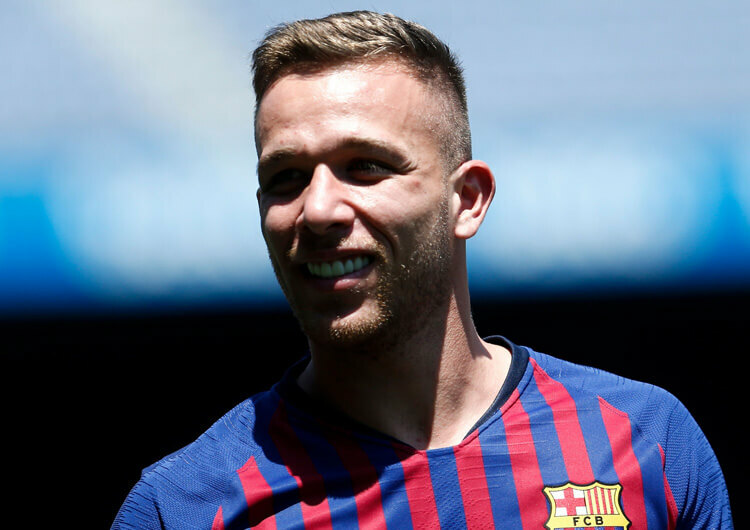 The hosts tried to use the ball into their full-backs to tease the Barcelona full-backs towards the ball and create space for diagonal runs from their attackers. The role of the Atleti midfielders when the ball went wide was to ensure that the ball couldn’t be cut back to any Barcelona players arriving on the edge of the box. The back four would defend the box from crosses. Barcelona set up in their usual 4-3-3 formation, with Lionel Messi, Luis Suarez and Arturo Vidal as the attacking trio. 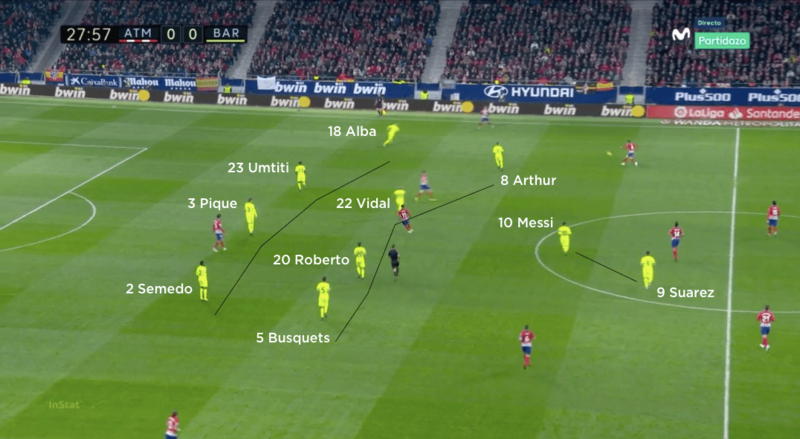 The visitors used a 4-4-2 mid-block out of possession, with Messi pushed up alongside Suarez on the top line – but they spent very little time in this structure because of their dominance with the ball. 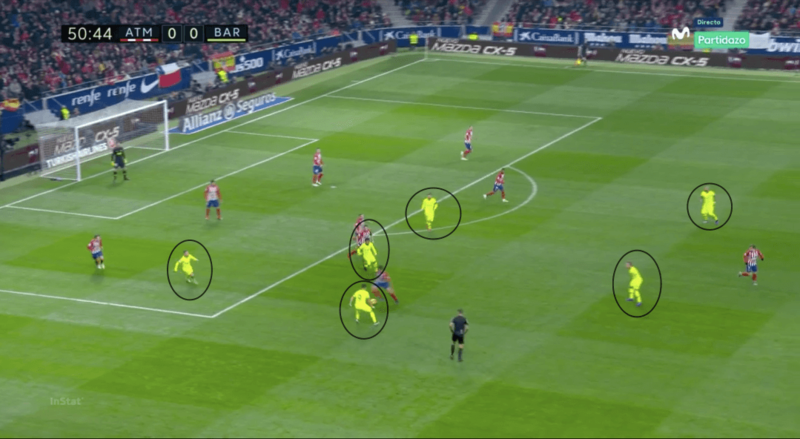 With limited options through a determined Atleti block, Barca used Sergio Busquets to try to play around them into the wide areas. 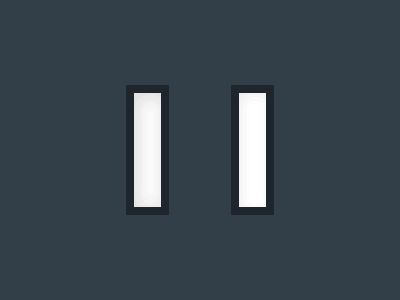 The hosts defended these effectively, too. Barcelona would counter-press immediately upon losing possession, which was made possible by their intelligent positioning when they had the ball. Barcelona set up in their usual 4-3-3 formation, with Sergio Busquets, Arthur and Sergi Roberto forming a midfield three behind Lionel Messi, Arturo Vidal and central striker Luis Suarez. The visitors dominated possession but had real difficulty in penetrating through the Atleti mid-block. A lot of Barcelona’s ball movement on the night was horizontal, between their full-backs and centre-backs. Limited movement ahead of the ball meant that forward passes tended to be into feet and then returned to the back line with no penetration beyond that.  Consequently, Messi began dropping deeper and deeper to collect the ball; he was seemingly the only Barca player willing to try passes between the Atleti units, or commit opponents towards the ball in an attempt to create space elsewhere. As Barca were struggling to play through, they had to try to play around. Busquets would drop deeper in order to push full-backs Nelson Semedo and Jordi Alba higher up the pitch, where he would then try to find them with clipped passes. They failed to tempt the Atleti block out to press Busquets, however; instead, the hosts dropped still deeper to effectively nullify the threat of the ball into the full-backs. Part of the issue for Barcelona was a lack of third-man movement, a strategy they so commonly and successfully employ. Instead, they tended to simply move as individuals rather than in relationships, making the hosts’ job that much easier. The late introduction of Ousmane Dembele for Arthur allowed Messi to play as a midfielder, however, with an attacking three of Dembele, Suarez and Rafinha in front of him. This caused Atleti more problems and eventually led to the equalising goal, which Messi created for Dembele. Out of possession, Barca switched between a high press and a 4-4-2 mid-block. 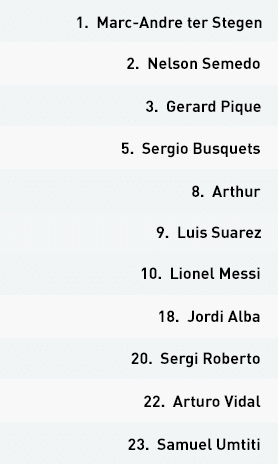 The mid-block would have Messi and Suarez as the front two, while Vidal tucked in alongside Busquets, Arthur and Roberto to form the midfield four. 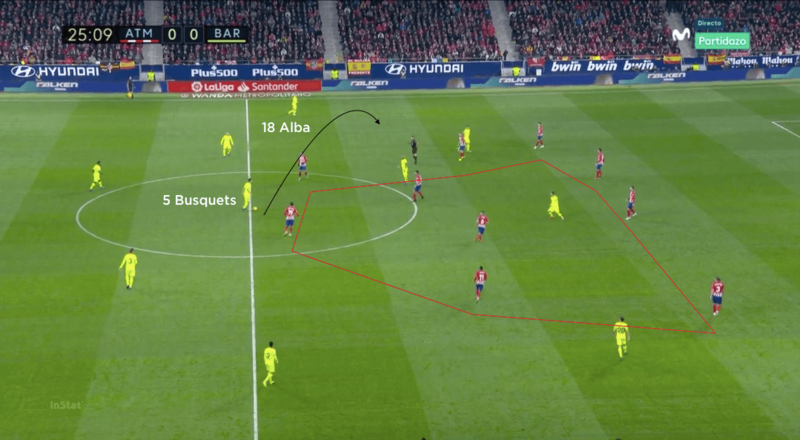 Due to Barcelona’s dominance in possession, however, they spent very little time in this structure, and the majority of their defensive work came in the form of a counter-press. 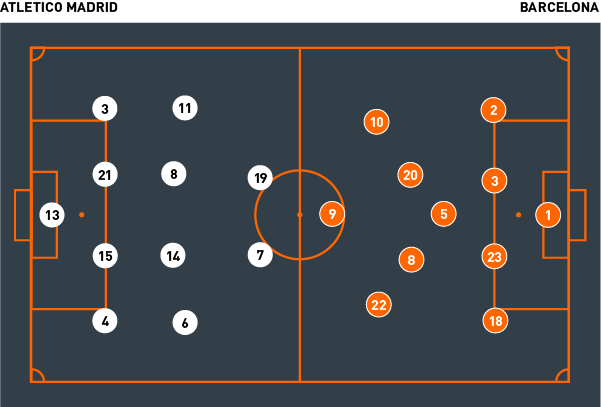 When attacking, they would ensure that they had players positioned relatively close to each other and, crucially, behind the ball too. At the point of losing possession, they were thus able to swarm the ball, prevent the counter and regain possession as quickly as possible.